Glass Beach: "What? What? Wait, that's me!!" This is what I said to the youngest kidling this morning when I was reading one of my favorite blogs, CraftBoom! Once a week, CraftBoom's Lisa features three Etsy shops and this week one is mine! I've mentioned CraftBoom! before in my post about excellent photography tutorials. It's an excellent resource for marketing a craft-related business and I highly recommend spending some time there. 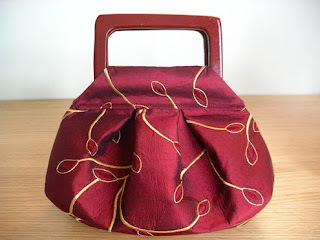 Lisa also owns a lovely on-line shop, U-Handbag, that is full of all sorts of bag-making supplies and fabrics I covet. And she has another excellent blog for that shop, U-Handblog, which I haunt every day. AND she is a bag-maker extraordinaire who shares her expertise with a wide range of tutorials. She is someone I highly respect and I'm honored she picked my shop to feature. Speaking of rock stars, I might have one over to my house tomorrow for a recording session with Chris. I'll let you know who if the session actually happens! I just found your blog courtesy of Lisa Lam. Be prepared for your stats to shoot through the roof now! I think Lisa is the Oprah book club of the blogosphere. Anyway, I immediately knew you reference to Courtney Cox and Bruce Springstein! Guess we know how old each other is!! Thanks so much for the compliment, imake! Welcome, Lisa! Hee, I think Lisa Lam is the Oprah book club, too! My husband has had a crush on Courtney Cox ever since Family Ties. That dates him, but he and I are exactly the same age (off by 23 days) so it dates me too. Holy Cow! Just went to check out CraftBoom, and now I am never going to get any work done today!